Review: "Minutian: Inwards" - Sea of Tranquility - The Web Destination for Progressive Music! One thing that quite a few modern progressive acts seem to miss � and something that classic bands such as King Crimson and Genesis pulled off with ease � is that instrumental prowess tends to be best presented as merely a side dish and not the main course of an album. While technicality and complexity are usually crucial ingredients in progressive rock as a whole, emotion and drama are just as important. Remember how that layered Mellotron orchestration in King Crimson's "Epitaph" created intense feelings of dread and fear? Or how Pink Floyd's soundscapes convey an incredibly spacious atmosphere that makes you feel like you've entered a different world? That's the kind of work that really connects with a listener, instead of just sounding impressive on a surface level. Well, it seems that there's a Finnish progressive rock band who captures the balance between technicality and emotion as if it is second nature, and they are known as Minutian. 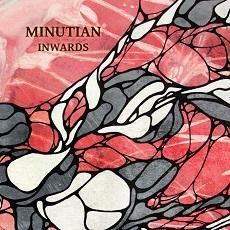 Then again, Minutian have every right to come at their newest album Inwards from an emotional angle. The band lost one of their founding members, guitarist Jaakko Jernberg, in 2012; this caused the band to contemplate whether they should continue playing and recording. Well, the fact that they ended up continuing is just wonderful; Inwards is not only a superbly-crafted album, but it's absolutely beautiful as well. While the album is a mixture of progressive rock and progressive metal, even the metal portions come with incredibly dark and melancholic elements. "Manifest" and the opening track "Hollow Heroics" bring out much of the album's heaviest material, while many of the others display a more serene vibe; of course there are also many neat moments with unconventional time signatures, such as the calm 5/4-time acoustic introduction of "Burning Bright" and the many technical rhythm shifts of "Manifest." The members' abilities are superb, and none of the key and time changes feel forced or without reason. But when you get down to it, the best thing about Inwards is the use and timing of its dynamics. "Aphelion" is the greatest example on the record, weaving through multiple build-ups and subtle instrumental cues throughout its 10-minute run time before reaching an explosive climax as it nears its end. "Hollow Heroics" is also notable for its dynamic shifts, giving a reasonable amount of attention to both the distorted metal portions and the acoustic elements that also serve to kick off the song. In any case, these moments really help in varying each song's mood and overall vibe; some songs even display more uplifting melodies in contrast to all the melancholy, such as some of the acoustic moments of "On Derelict Sidings." If there's any weakness on Inwards, it's that some of the songs tend to drag on for a little too long. For instance, the main motif of the aforementioned "Derelict Sidings" gets a little bit old after a while. It sounds neat when the acoustic guitar is blending with the piano, but the overall song could have been cut down by about two minutes. It would have been nice to hear some leaner tunes like "Manifest," songs that rely a bit more on the heaviness to contrast the more ornately arranged songs. But these are just nitpicks in the long run. If anything, Inwards is proof that not only is progressive rock alive and well, but also has plenty of room for expansion. Minutian said that some of their biggest inspirations were King Crimson, Tool, and Fates Warning; however, modern progressive rock acts should now be taking notes from this band as well. They took their classic inspirations and reconstructed them in a daring and meaningful way, incorporating a beautiful sense of atmosphere and skillfully-implemented dynamics into their complex rock/metal. Wherever Minutian go from here, I can honestly say this could end up being one of the finest progressive rock albums of the entire year. Minutian is another recent discovery for me. The Finnish band released their debut Repercussions in 2011. Unfortunately, tragedy struck the band with the death of their original guitarist Jaako Jernberg. Stemming from their loss is their brand new effort Inwards, dedicated to Jaako's memory. The music on Inwards could be labeled as heavy atmospheric progressive rock, progressive metal or alternative rock. No matter what you call it just know this, Inwards is an excellent album. The band consists of Mikko Heino (vocals), Jesper Johnson (guitar, backing vocals, synth), Pekka Loponen (guitar, backing vocals), Jouni Mikkola (bass, backing vocals) and Antti Ruokola (drums, percussion, synth, samples). Many of the songs are built upon atmospheric intros and changing dynamics. I certainly hear elements of Oceansize in their music which is never a bad thing. Tool and Mastodon crop up as well. Ruokola's drum work, in particular, has a certain Tool-like quality. Jangly arpeggio guitar begins the first track "Hollow Heroics" before heavy riffs and Heino's gruff-like lead vocals enter the fray. Soon the riffs turn into a slower dirge, similar in style to the mighty Sabbath. In "The Crust Of The Earth" there is a definite Oceansize-like atmosphere. The fluid guitar solo near song's end absolutely soars. "Void Within" is a dramatic rock tune turning from light to heavy while "Manifest" is heavy from the start with another soaring guitar solo and chugging riffs. The ten plus minute "Aphelion" takes its time building on a repeating guitar motif before the riffs become more Sabbath-like and the band really starts to cook. The last track "Redeemer", written by Jaako, is an atmospheric and gentle offering and a fitting tribute to their fallen member. If you enjoy the likes of Oceansize, Tool, Mastodon and related bands, Minutian should be on your radar. Excellent stuff.